Patent Agent vs Patent Attorney – Who Is Better? Who is better, a Patent Agent vs Patent Attorney? In many cases there is no winner as both patent agents and patent attorneys can handle most everything that is needed to write and file a patent with the US Patent Office (USPTO). For about 95% of all inventors choosing either a patent agent or a patent attorney should not matter, however, as shown in the table below, patent attorneys are able to do a few things which patent agents cannot. Warning: Only these patent agents and patent attorneys called "registered practitioners" are legally allowed to file patents for inventors and companies (Tip: make sure you look people up here to see if they are registered: https://oedci.uspto.gov/OEDCI/). As you may have seen online, there are hundreds of companies advertising to help you with your patent but very few of them will actually tell you if they are a registered practitioner so please be careful. 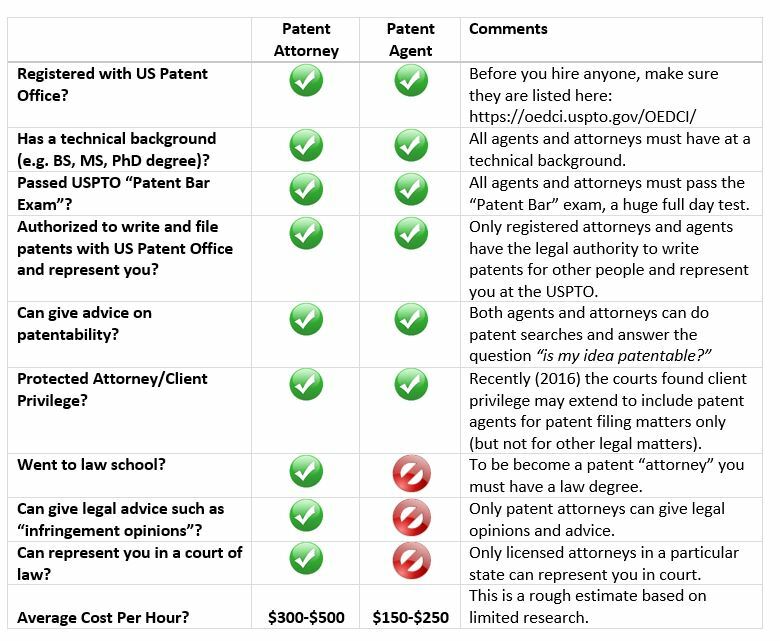 The table above shows a quick summary of a patent agent vs a patent attorney. As you can see, both agents and attorneys can handle all matters related to writing and filing a patent. In most routine patent matters it should not make a difference if you hire a patent agent or patent attorney. However, there biggest area where you will certainly need a patent attorney and not a patent agent is if you need legal advice and legal help. This most frequently occurs when you want to know if your new invention may be violating or "infringing" on an earlier patent. Only attorneys can give this type of advice. So who is better, a patent agent vs patent attorney? Experience: How long has the patent agent or patent attorney been practicing? Background: What type of background do they have? Do they specialize in a particular area that matches up with your invention? Qualifications: Are they registered with the patent office? Where did they get their training? Are they part of any groups or hold certifications? Reviews and Referrals: Can you see any online reviews of this person or their company? Work Product: Can they send you a list of patents or patent applications they have already written? Price: It is fair to ask them for a fixed fee price quote (including USPTO fees). Its very hard to compare a patent agent vs a patent attorney. Over the past 15 years I have worked with some amazing patent attorneys and some amazing patent agents. Sadly I have also seen very poorly written patents from both patent attorneys and patent agents. One of the worst patents I have seen was written by an attorney at a large (top 5) law firm who charged $500 per hour and the inventor had no idea it was bad until they tried to actually enforce it. Sadly unless you know a lot about patents (and in particular patent claims), it is hard for the average person to know if they are working with a good patent agent vs patent attorney. The best you can do is to follow the items listed above and look at their experience, background, qualifications, etc. and try to talk the person to understand how they communicate and if you will enjoy working with them. Optional (not requried) If you have any photos or drawings, please upload them here.